My family is full of pie fanatics. I have always been afraid of hand making a pie, because the crust always scared me. My mom would always let me help her make pies for thanksgiving and other holidays, but I never wanted to try by myself because I was scared I would ruin the pie with a “crumby” crust ;). So this year for Father’s Day, I conquered my fear and made my first pie by myself. I made a blueberry pie per his request. My mom’s pies are famous for their crusts. We have always used this recipe for our crusts from the Better Homes and Gardens New Cook Book. The keys to success are to not handle the dough too much or it will be come tough, don’t add too much water or the dough will be too sticky. I 1 1/2 the dough recipe to be sure that I had enough even if it tore a bit. I hope one day I can completely master this skill, but that will take a lot of practice, I won’t complain about having pie a bit more often! Good luck on your pie making adventures, don’t be scared off by the crust, it really isn’t too hard once you get the hang of it! Mix first three ingredients in a bowl. 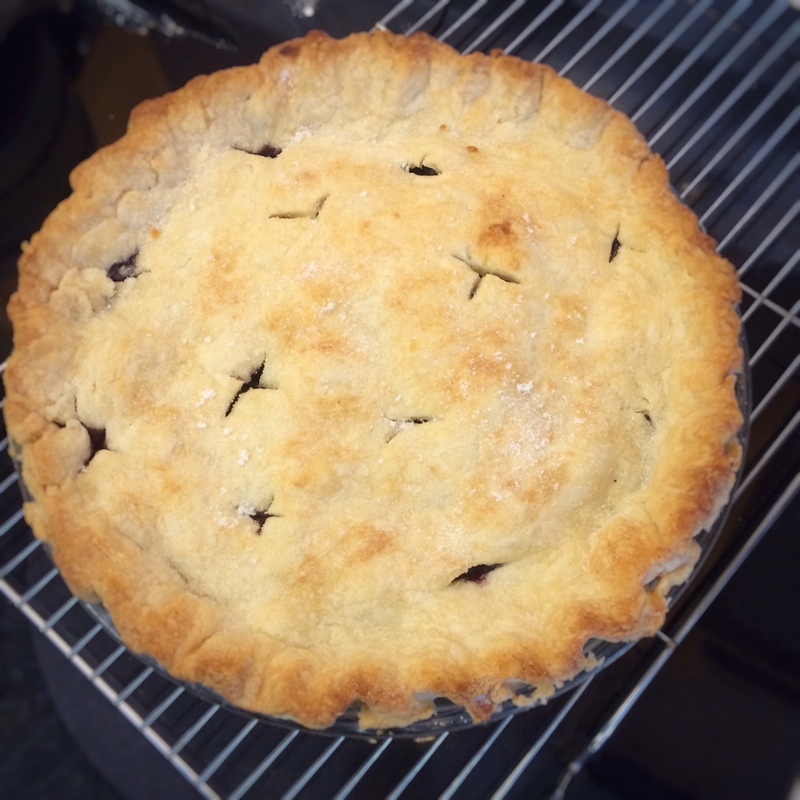 Pour washed blueberries in a pastry lined 9-inch pie pan. Sprinkle dry mixture over berries. Place top crust on. Make sure there are ventilation slits. Flute edges. Sprinkle sugar along the top. Bake in 400 degree oven for 40-50 minutes.